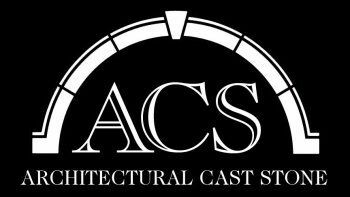 * Value Engineering – Let ACS help you win the job. We can offer you the widest range of options in the industry to help you value engineer and close the job. From traditional fabrication techniques, piece consolidation to minimize labor, to utilizing our automated production line, we can help you find a unique and cost-effective solution for almost any project. * Our line of Cast Stone Masonry Units is 100% wet cast. We offer standard sizes and large format units up to 1’-4” x 3’ x 3 5/8”. Our machine-made units are a perfect match in color, texture and finish to our custom pieces. * Custom pieces up to 30,000lbs. * Our GraniteCast™ and KasotaCast™ are unique products that can help give you a cost advantage over natural stone.